広島県とタミル・ナドゥ州との経済交流に関する覚書の調印式へ参加しました （インド市場視察・ビジネスマッチングセミナー参加）: リサイクルエナジーブログ　RECYCLE ENERGY CO.,LTD. We attended the signing ceremony of MOU to promote economic cooperation between Tamilnadu and Hiroshima. We visited Chennai, India together with the member of “Hiroshima Industeial Promotion Organization”. Then we move to the hotel to attend the signing ceremony of MOU to enhance and promote economic cooperation between Tamilnadu and Hiroshima. The governor of Hiroshima Prefecture. Later on, we had a chance to talk to the executive vice chairman of industries department, government of Tamil Nadu Single Window Facilitation office. He told us that they are having garbage problem especially with plastics. So our technology has a great potential to be successful in India. Then we visited Tamilnadu pollution control board for meeting. We’ve learned the current situation of waste management in this state. Seems like they will start garbage separate collection soon. For dinner, we got a chance to visit Japanese general consulate in Chennai for dinner party. The second day, we attended the business promotion seminar. 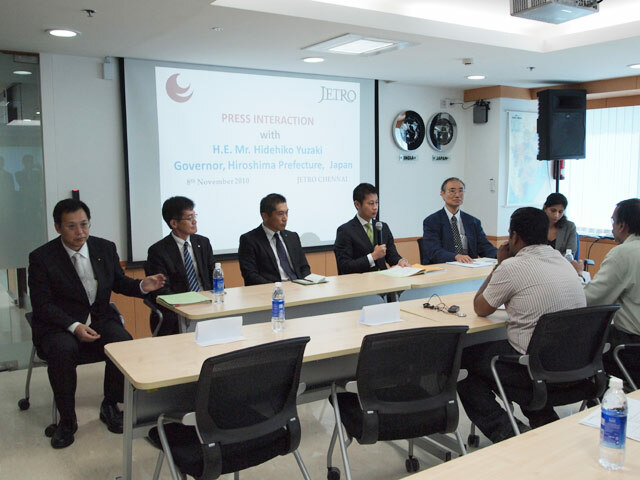 First, our governor had a presentation about Hiroshima industries. Then the executive vice chairman of industries department presented a investment climate of Tamilnadu. After that, presentation time for several Hiroshima companies was arranged, and I was one of them. I was very nervous to talk on the big stage, but as a result many people interested in our technology. So we could have business meetings with 15 companies after all. On the third day, we visited several companies which are in the recycling industry. Because there is continuous trading deficit in India, the Special Economic Zone was founded to help to increase exporting. At night, we attended the dinner party hosted by Hiroshima pref. We could learn a lot about living situations in India. Many interesting stories. On the last day , my boss and me went to sightseeing the city. There were a bunch of garbage on the street. There are many people making income by picking up the valuable material from garbage damp, Children too… they have to do it to live. We had a very complicated feeling by actually see the situation. From this trip we learned a lot about the Indian market. We're proud to join the ranks of the innovative Hiroshima companies reaching across the world. We will devote ourselves to making Recycling Energy a major contributor to the burgeoning foreign market as a Hiroshima leading company.